Gua sha and cupping are two therapeutic methods used commonly with Asian bodywork and acupuncture, or as stand-alone modalities. They improve qi flow by facilitating the removal of stagnated blood and lymph, allowing the body to process toxins, reducing pain and swelling, and positively affecting the immune system. Gua sha and cupping can relieve pain associated with acute or chronic disorders that may feel achy, tender and/or knotted. Common conditions that benefit include low back pain, stiff neck, shoulder pain, stomach ache, abdominal pain, dysmenorrhea, and sprains. Gua sha and cupping are also used to prevent and improve symptoms of acute conditions such as common cold or flu (esp. in the early stages), headaches, asthma, and bronchitis as well as chronic problems. Gua Sha means “scraping” and “sand or millet-like” and refers to rubbing that leaves reddish, elevated, skin marks. Oil is applied to the skin and rounded tools made of jade, buffalo horn or similar substances are used to scrape the skin’s surface. These tools contain properties that allow them to pull heat and toxins from the body, which aids in healing. Cupping is a therapy in which a vacuum is created in a glass cup to draw stagnant fluids up to the surface tissues. Traditionally a cotton ball is dipped into alcohol and lit with a flame. It is then inserted quickly and removed from the cup. This method does not heat the cup, but instead creates a vacuum or reverse pressure that when applied to the skin affects acu-points, surrounding tissues and circulation. In both gua sha and cupping it is common for the local area to turn reddish to purple where the body has held stagnation. Darker color areas usually indicate a longer standing condition that may require a longer treatment period. Any discoloration generally disappears in about a week. 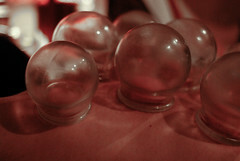 Cupping and gua sha, as with most bodywork, induce a feeling of relaxation during and after treatment. Please let your practitioner know about any bleeding disorders, skin hypersensitivities or medications such as blood thinners and steroids prior to receiving any treatment.